School hosts “Chandigarh North District Netball Championship 2008” for “Kailash Bahl Memorial Trophy” in memory of Mrs. Kailash Bahl. 500 Netball players take part in Championship. “Chandigarh North District Netball Championship” for “Kailash Bahl Memorial Trophy” concludes gracefully. President, Netball Federation of India Sh. Gurbir Singh praises Mrs. Madhu Bahl, President, Chandigarh North District Netball Association for taking the initiative to promote Netball game. School children enjoy a gripping match between India and Sri Lanka during the International Netball series for Women 2009 conducted by Principal Mrs. Madhu Bahl, President, Chandigarh North District Netball Association. Shri Ram Niwas Verma, Home Secretary and Education Secretary, Chandigarh Administration gave away the winner’s trophy to the Indian team and mementos to Sri Lankan players. School Netball Junior Boys Team secures 3rd Position in State Netball Junior Championship. School Boys Netball Team emerge champions in Under-19 age group after defeating Ryan International School, Sector 49, Chandigarh in Inter School Netball Championship organized by Chandigarh Administration. 14 Teams slug it out for the 2nd Kailash Bahl Memorial Netball Trophy during Chandigarh Junior Boys and Girls Netball Championship. 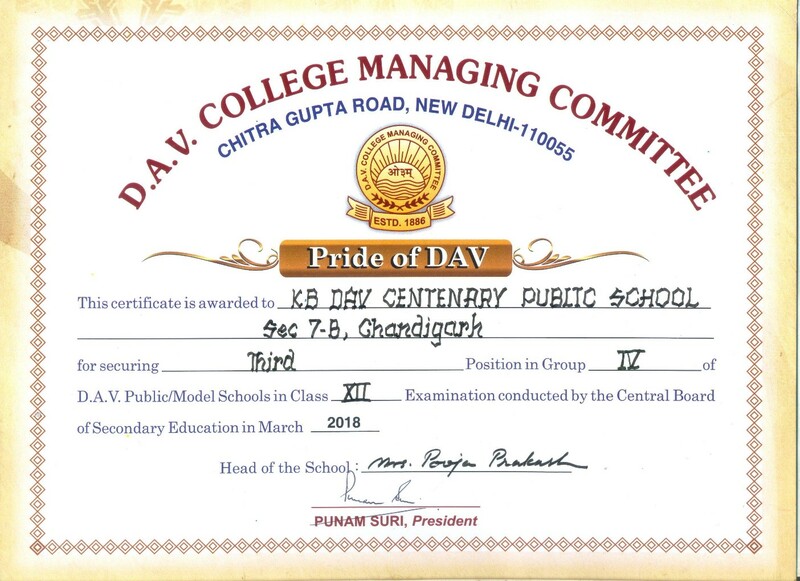 DAV-7 Boys team fetches 2nd Prize, Trophy and Silver Medals. While Girls Netball team wins the 3rd Prize, a Trophy, Bronze Medals and Certificates. School in association with Chandigarh North District Netball Association organizes the Chandigarh Junior Boys and Girls Netball Championship 2010. Vying for the 3rd Kailash Bahl Memorial Netball Trophy, the Under-17 Boys Team wins the 3rd Prize and the Under-19 Girls Netball Team also wins the 3rd Prize. Enthusiastic participation marks the Annual Sports Day organized by Education Department, UT Administration, Chandigarh. The school Netball Under-19 Boys clinches 1st Position. The winning streak continues. The under-19 Boys Netball Team claims the 2nd Prize, while the Under-19 Girls Netball Team wins the 3rd Prize in the Inter School Netball Tournament organized by Education Department, Chandigarh Administration. Under-17 Boys Netball Team clinches the 1st Prize in the Tournament. The school Netball (Boys) Team secures Third place and Bronze medal at the Mini Olympics Tournament held at Banyan Tree, Chandigarh. The Under-17 (Boys) School Netball Team of Gurshinder, Sahil Gupta, Gurpreet Singh, Ankit Kumar, Nipun, Paramjot, Samarth, Samar, Rahu, Uday, Gurpreet Singh and Vaibhav of Class X steals the show by clinching First Position and Gold Medal at the Inter-School Netball Tournament organized by Chandigarh Administration at Govt. Model Senior Secondary School, Sector 20, Chandigarh. Under-19 years (Boys) School Netball Team comprising of Shubham, Kartik, Sunny, Pranjal, Sudit (Class XI), Sarfaraj, Rahul Sharma, Abhilash, Shahbaz, Shray, Sahil Malhotra and Paras (Class XII) wins First Prize and Gold Medal at Inter-School Netball Tournament. The Netball players Deepali, Tarvinder, Nancy, Kritika, Sugandhika, Rajwant Kaur, Himala, Anmol and Vibhuti win the First Prize and Gold medal in the Under-19 (Girls) Inter-School Netball Tournament. 4th Kailash Bahl Netball Championship is held at KBDAV-7, Chandigarh in collaboration with Chandigarh North District Netball Association, wherein teams vie for the 4th Kailash Bahl Netball Trophy. 5th Kailash Bahl Netball Championship is held at KBDAV-7, Chandigarh in collaboration with Chandigarh North District Netball Association, wherein teams vie for the 5th Kailash Bahl Netball Trophy. The school co-hosted Mini 2012 Olympics and became the venue for Netball and Karate Championship. The school Netball Team (Boys) comprising of Gurshinder Singh (XI-B), Sahil Gupta (XI-D), Paramjot (XI-B), Sunny Dhingra (XII-D), Paranjal Seth (XII-C), Prateek Sharma (XII-D), Uday Katoch (XI-D), Parth Sharma (XII-D), Karthik Nair (XII-A), Samarth Vir (XI-A) and Akshay Narula (XII-D) won the Bronze Medal. The School Netball Boys Team (U-19 Category) of National Players claims the Gold Medal in the Inter School Netball Tournament (Boys), organized by Chandigarh Administration. The team comprising of Gurshinder Singh Ghotra (XI-B), Sunny Dhingra (XII-D), Sahil Gupta (XI-B), Pranjal Seth (XII-C), Paramjot Dhillon (XI-B), Akshay Narula (XII-D), Uday Katoch (XI-D), Prateek Sharma (XII-D), Parth Sharma (XII-D), Samarthvir (XI-A) and Karthik Nair (XII-A) fetched laurels by continuing the winning streak. The school Netball Team (U-19 Category) clinches the First Position in the Inter School Netball Tournament (Girls). The Gold winning team comprised of Sugandhika Samdhian (XII-A), Manika (XII-A), Rajwant (XII-A), Jaspreet (XI-D), Bhanvi (XI-A), Savi Anand (XI-D), Bhavya Sharma (XI-B), Shimmona Rana (XI-D), Gurleen Kaur (XI-D), Swati Raghu (XI-D), Ayushi (XII-C) and Nancy Taneja (XII-A). Riding high on good form, Shooters of KBDAV-7, Prince Verma & Ajay Srivastava, students of Class X, cornered glory to clinch second and third places respectively in the 0.177 Air-Pistol event during DAV National Sports, Inter School Sports and Games Competition held at DAV Public School, Sahibabad, UP organized by DAV College Managing Committee, New Delhi from December 7 – 9, 2013. Vanshika Saini of Class VIII-C, Tamanna Mann of Class X-C won a Bronze Medal and Tushar Saini of Class X-C and Sahibdeep Singh of Class IX-A won a Silver Medal each in 51st National Roller Skating Championship 2013-14 held at Sirsa. The event was organized by Roller Skating Federation of India. Harshit Saini of Class VIII-C, Mohit Kumar of Class IX-B, Hakashpreet Singh, Gaganpreet Chugh of Class X-B won a Silver Medal each in 51st National Roller Skating Championship 2013-14 held at Sirsa. Aastha Kataria of Class XII-C and Jaspreet Kaur of Class XII-D won a Bronze Medal in 51st National Roller Skating Championship 2013-14 held at Sirsa. Our students have always shown their mettle in sports and have made outstanding achievements in skating. The school is equally proud of its unique sports achievements may it be Swimming, Netball, Table Soccer, Cricket, Badminton, Golf, Cycling etc. It gives training facilities for all major games and takes pride in its students who have won enviable positions in several national and international championships. Sports Authority of India honours Karan Bhai and Sparsh Arora with a cash award of Rs. 6,600. Karan Bhai, Ishaan Bakshi and Sparsh Arora bag 1 Gold Medal each at Chandigarh Administration Inter School Swimming Tournament. Karan Bhai wins 2 Gold medals and 1 Silver medal in Interschool Swimming Competition organized by Chandigarh Sports Department. Karan Bhai clinches 2 Gold and 1 Bronze medal in the Administration Swimming Tournament. Karan Bhai wins 3 Gold Medals in State Inter School Swimming Tournament organized by Education Department, Chandigarh Administration. Jasmeet Kaur of Class VI-A made a mark for herself by winning First Prize in 50 Meter Free Style, 100 Meter Free Style and 50 Meter Back Stroke Under-14 respectively in the Inter School Swimming Tournament (Girls), organized by Education Department, Chandigarh Administration held at Swimming Pool, Yoga Centre, Sector 23, Chandigarh. Lakshit clinches 1st Position in the Under-14, Sub Junior Boys, up to 17 Kg, Shivalik Cup Taekwondo Championship 2010 organized by Suraksha Taekwondo Academy, Chandigarh held at Shivalik Public School, Phase VI, Mohali. Jasmeet Kaur and Gurnoor Kaur clinch a Gold Medal at the North Zone School Sub-Junior Girl's Taekwondo Championship 2012 organized by St. Attri Senior Secondary Public School, Lalru Mandi, Distt. Mohali. Budding National Cricketer Shubham Vij of Class IX-A attends the 6-Day State Cricket Camp organized by Himachal Pradesh Cricket Association. Shubham Vij, National Cricketer of Class IX-A wins Gold Medal and Trophy after Shimla District Cricket Team beat Solan District Cricket Team. Kanwaljeet Singh of Class IX, an upcoming Cricketer of Chandigarh Cricket Team, is selected for the 11th All India National League Cricket Tournament to be held at Punjim, Goa by the Cricket Council of India. Budding Cricketer Ayudh Sharma of Class IX-A is selected for the Punjab Under-16 State Camp to be held at PCA Stadium after hitting 122 Runs in 168 Balls, with 18 Boundaries in the Semi-Final of the Summer Cricket League Under-16 Tournament at Government College Ground at Kapurthala. Rajat Dahiya, a Class VI student, shines in the Inter School Wrestling Tournament organized by Education Department, Chandigarh Administration at Sports Complex, Sector 42, Chandigarh. Wins Silver Medal in the 42 Kg group. Rajat Dahiya of Class VII-B wrestles away a Silver medal in Under-14 (42 Kg category) in the Inter-School Wrestling Tournament (boys) organized by Education Department, Chandigarh Administration. Fitness remains the key to good healthy lifestyle. Kartavya Gupta, Class V and Akshit Gupta, Class X win Bronze Medal in the U-14 Boys and U-17 Boys respectively in the Inter School Gymnastic Tournament conducted by Education Department, Chandigarh Administration at Sports Complex, Sector 7, Chandigarh. Budding Gymnast Palak (Class III-B) won Gold in Free Handball Event and a Silver Medal in Rhythmic Gymnastics in the U-8 category in the 39th Chandigarh State Gymnastic Championships (all age groups) at Sports Complex, Sector 7, Chandigarh. Gaurav Rana bags a Gold Medal and selected for Karate National Tournament. Sub-Junior Shot-Put Championship 2011 organized by Chandigarh Athletics Association held at Sports Complex, Sector 46, Chandigarh. Aftab Alam of Class IX-B won a Silver Medal (in singles) in the Inter School Table Soccer Tournament organized by Education Department, Chandigarh Administration at Govt. Model Senior Secondary Public School, Sector 19, Chandigarh. Taj Tarunveer Singh is the 2nd Runner-up at the 20th Junior National Korfball Championship organized by Korfball Association, Chandigarh.